Father’s Day, the unsung hero of the holiday calendar, that is, until now. Good news Dads, if Father’s Day ads are on point, you could be in for a treat. The National Retail Federation’s annual survey conducted by Prosper Insight & Analytics say that Americans are on track to spend a record-breaking $15.5 billion for Father’s Day in 2017, with 34% of buyers shopping online to find the perfect gift. So what does that mean for digital media owners and their advertisers and where is the money being spent for Father’s Day 2017? 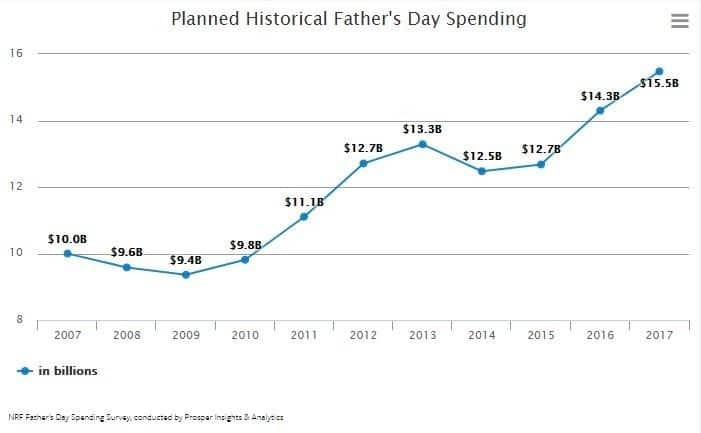 Unsurprisingly, Father’s Day retail spend doesn’t quite measure up to the flower-powered behemoth of Mother’s Day, but if advertisers have products or services that can target the Dad market, there is still considerable money to be made. With that in mind, advertisers need a strong online presence to showcase their products and services as much as possible to guide buyers to their websites and stores. Also, focusing on cross-device digital advertising to attract mobile users, especially as 18% of buyers will use them to make a purchase this year. Mobile ads are a huge opportunity to get noticed as increasingly, buyers research and purchase products on the move. However, it is not enough to just advertise, if you fail to invest enough on the creative the ever fickle Father’s Day shopper will dismiss your ad as buyers associate poor advertising with a poor quality product. Targeted, cross-device, media buying is obviously important, however, a failure to invest in creative will at best damage performance, and, at worst, will turn shoppers of your brand. Fortunately, Localstars are here to help. Take a look at these Father’s Day ads. They were all built using our ad platform. 48% dinners, brunches and other types of “fun activity/experience. Items like cologne, aftershave and razors rose nearly 20 % year-over-year. 25% of shoppers plan to buy gifts involving a sport or an event. Our HTML5 ad builder makes it easy to create hundreds of multiple shapes, cross-device ads. To find out how you can make beautiful digital ads quickly or if you need any advice about your digital advertising processes, get in touch with our team!